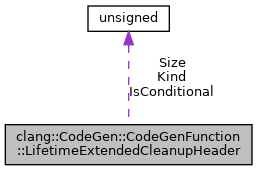 Header for data within LifetimeExtendedCleanupStack. Definition at line 508 of file CodeGenFunction.h. Definition at line 517 of file CodeGenFunction.h. Definition at line 516 of file CodeGenFunction.h. Definition at line 518 of file CodeGenFunction.h. Whether this is a conditional cleanup. Definition at line 514 of file CodeGenFunction.h. The kind of cleanup to push: a value from the CleanupKind enumeration. Definition at line 512 of file CodeGenFunction.h. The size of the following cleanup object. Definition at line 510 of file CodeGenFunction.h.